*Paul was out the door and doing yard work by 8 a.m. this morning. Around 9:30 a.m. we grabbed some gloves, shovel, fork, and plastic bags, and headed over to Bill and Debbie’s house to dig up plants to transplant in our yard. Christy joined us as well. *Before the transplanting project began, Paul and I did a walk through of Bill and Debbie’s house to see how the progress was going on their remodel project. I liked the look of their new “combined” closet space in their master bedroom. Going down to the basement was like a flash from the past. It had been probably close to 30 years or more since there was not carpet on the floor of the basement. The carpet is now gone, and it is just cement floor. That is the way it was growing up. I am not sure why this effected my the way it did, but seeing the cement floor transported me back in time. 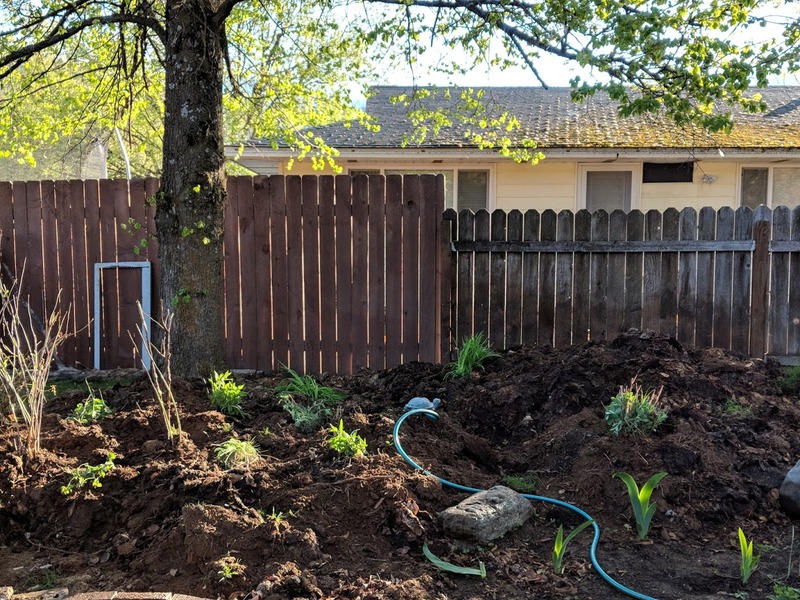 *Christy joined us for this project, and we started digging up a variety of perennials and bulbs and rose bushes and a rhubarb start. I nabbed a few more day lilies. We acquired some sedum, and I found the illusive hosta that was hidden among the Lily of the Valley on the side of the house, and dug it up and took it over to Christy. I forgot how many peonies Mom had in her yard. It didn’t take a whole long time to complete this project, and we were on our way. *Once at home, I was amazed at the amount of things we transported over to our yard. We figured out some places for some of the plants. But by the end of the evening, we just decided to plant them in the big dirt mound on the side of our house until we know where they are going to be located. *Having not slept well the night before, it was time for a little mid afternoon nap. *Around 4 p.m. my friend Linda came over and we talked some about my new way of eating, and how I feel like I have been successful, and the type of food I eat. *Lamb chops are becoming one of my favorite foods to prepare. They are SO GOOD!! We had a bit of a Greek-themed dinner tonight, with the lamp chops marinaded in some Greek spices, a large Greek salad, and some roasted broccoli. It tasted wonderful! *In trying to get my steps in for the day, I walked around the backyard for a while, then walked around the house until I felt the magical vibration on my wrist telling me I had made it to 10,000 steps.